This automobile sales / service operation is located on King George Highway, just north of White Rock, BC. 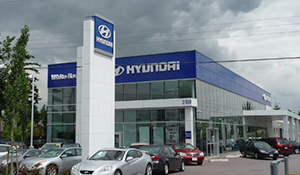 The building concept was provided to The COLBORNE ARCHITECTURAL GROUP Pacific by Hyundai Canada, to be adjusted to suit local planning and building bylaws. The site was very challenging due to restricted size and poor subsoil. The elongated, two-storey building with sales showroom to the front and service bays to the rear is located along the north property line with vehicle access, circulation and display parking to the south. The building is clad in Hyundai’s corporate-standard neutral glass/metal curtain wall system and split-face concrete block. Lot lighting and project signage are carefully controlled by planning guidelines as were all aspects of the building design and operations prior to corporate approvals being granted. Sandwell Engineering retained The COLBORNE ARCHITECTURAL GROUP Pacific for the design, fit-out and relocation of their Vancouver office to an existing building at 1045 Howe Street. 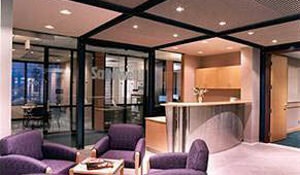 Four floors totaling 56,000 sq.ft were gutted, upgraded and refinished for new offices for a staff of 270 employees. The work included planning and design for the new offices as well as coordinating the relocation of existing furnishings and equipment. Three of the floors combined engineering disciplines and related support areas. The fourth level provided common reception, administration and logistical support functions. 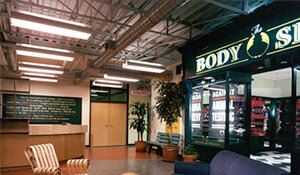 This internationally recognized retailer of body care products wanted to turn a vacant 67,000 sq. ft. c. 1950 printing warehouse into a state-of-the-art office/ production facility with employee training school and daycare, highlighting a corporate commitment to profitability based on social and environmental sustainability. The design incorporates leading-edge energy-saving and waste-reduction features, including biological waste-treatment ‘Living Machine’, ground-source heat-pumps, extensive natural day-lighting with extensive building envelope upgrades. Low-impact, recycled building materials were used through-out including Canada’s first carpeting from recycled plastic bottles. Lively colours and use of natural finishes mark all interior spaces, including ‘streets’ showcasing products and new advertising campaigns. The site was fully landscaped with employee amenity spaces and carefully selected planting, in some cases used as product ingredients.